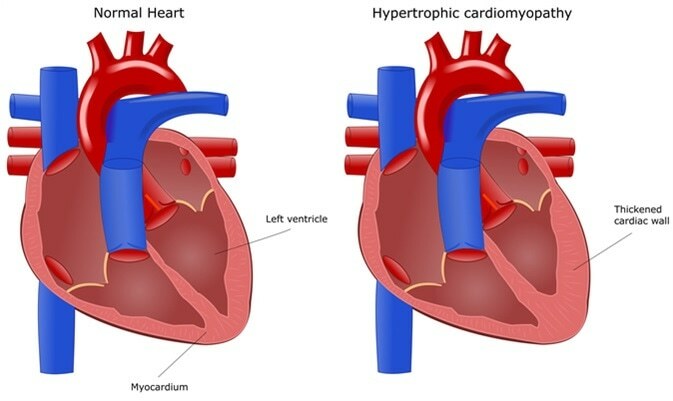 Hypertrophic cardiomyopathy is a condition that affects the heart’s ability to pump blood effectively due to the thickening (hypertrophy) of the heart muscle which becomes stiff as a result. The condition is very common and affects around one in 500 men and women in the UK. It can affect people at any age and, among young people, it is a common cause of sudden cardiac death. The condition affects the muscular wall of the lower heart chambers (ventricles). Usually, only the left ventricle is affected, but sometimes both the ventricles thicken. The ventricular stiffness may reduce the heart’s filling capacity and therefore the amount of blood that can be pumped around the body with each heartbeat. The thickening of the heart walls may also block blood flow from the heart, a condition which is sometimes called obstructive hypertrophic cardiomyopathy. In hypertrophic cardiomyopathy, the damaged heart muscle can also disrupt the heart’s electrical signaling system, which may lead to arrhythmia and increase the risk of heart attack and cardiac arrest. Hypertrophic cardiomyopathy is a hereditary condition caused by one or more genes that affect proteins in heart muscle cells. The cells become disorganized and enlarged and the muscle often becomes scarred. Each child born to a parent with this condition is at a 50% risk of also developing it. Echocardiogram: This test shows how the heart is pumping. By carrying out an echocardiogram, a doctor can tell whether the heart muscle has thickened and whether blood flow has become impeded. Electrocardiogram: Here, electrodes are placed on the skin to measure and record the electrical signaling in the heart and detect enlargement of the heart chambers and arrhythmias if present. Exercise test: A patient walks on a treadmill while an ECG is performed, along with breathing and blood pressure measurements, to check how well the heart is functioning during activity. MRI scan: A cardiac MRI scan is often also performed to allow detailed assessment of the heart. The scan generates detailed images of the heart using magnetic fields and radio waves. Genetic testing: If a patient has a first-degree relative with hypertrophic cardiomyopathy, genetic screening may be offered to determine whether they are carrying some mutations that are associated with the condition. Studies have shown that with proper management and therapy, people who have developed symptoms due to hypertrophic cardiomyopathy can lead a normal life.